Exciting things are happening at the, newly renamed, Adaptive Fitness Clinic, previously the Fitness Clinic for Individuals with Disabilities. In the Fall semester, new Program Director, Matt Soto (RKT), took over with Melissa Diek (MA) as the Assistant Program Director and Kathy McCarty-Baker (MA) rounding out the staff roster. All are SDSU graduates and excited to be giving back to their alma mater. The SDSU Adaptive Fitness Clinic’s mission is to provide safe and affordable access to fitness for people with disabilities, while demonstrating excellence in educational programs and community service. Serving over 140 individuals from the San Diego region, Clinic staff teach kinesiology undergraduate students to assist clients with their wellness goals. 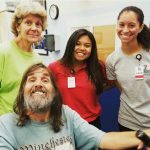 Students learn exercise progression, time management, and interpersonal skills for an underrepresented population in fitness and have a unique, clinical experience. 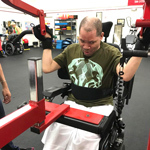 While, at the same time, real community members benefit from affordable fitness training that can supplement their current rehabilitation. The Clinic celebrated the end of the Fall semester with its first-ever, crowdfunding campaign through SDSU’s Strive. It was a huge success, raising $2,000, which will go towards updating equipment to provide the best experience for clients and students. In an effort to connect more with the community, both on campus and off, collaborations have been made between the Clinic and some like-minded groups. Connecting with the Doctorate of Physical Therapy (DPT) department has allowed the kinesiology undergraduate students to learn directly from DPT students and get a taste of their program while giving DPT students a mentoring opportunity. In the business school, the Marketing 472 class used the Adaptive Fitness Clinic as a project site to educate students on setting up focus groups and reporting findings. Off campus, partnerships with the San Diego Alzheimer’s Association, the MS Society, Sharp Hospital’s Spinal Cord Injury support group, and the Wounded Warrior Project challenge students to make educational presentations and work with an even wider array of disabilities, broadening their scope. An overhaul to the website, a more active social media presence, and the creation of home exercise videos to teach clients how to stay fit on their off days are just a few of the changes that have occurred over the past academic year. Additional projects on the docket include new efforts for fundraising, revamped student projects, and a fresh coat of paint. All in all, big things are happening at the SDSU Adaptive Fitness Clinic. Staff invite any and all to stop by or keep up with them on social media to see these changes coming in to effect. See Recent Photos in our New Photo Gallery! We have a new photo gallery page - Take a look at some of our clients and trainers in action!